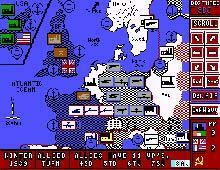 The Big Three is a grand strategic-level wargame set in World War II that covers the entire Europe, Northern Africa, and Eastern Russia. You can play as one of the "Big Three" (US, UK, or Russia) and coordinate combined arms attacks with the other 2 superpowers. Each side gets some Military Points per turn for building new or replacement units and moving them. The AI is none too bright, but it's a commendable ambition that won't be repeated until SSI's Clash of Steelyears later.